, a very ingenious metaphysician and natural philosopher, was born in 1686, or 1687, at Old Aberdeen, in Scotland, of which city his father was a merchant, and educated in king’s college there. 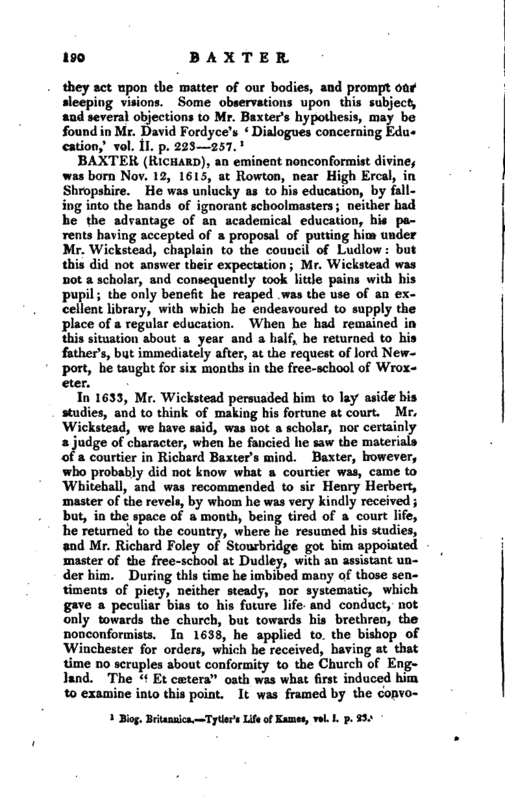 His principal employment was that of a private tutor to young gentlemen; and among other of his pupils were lord Grey, lord Blantyre, and Mr. Hay of Drummeizier. About 1724, he married the daughter of Mr. Mebane, a clergyman in the shire of Berwick. A few years after he published in 4to, “An Enquiry into the nature of the human Soul, wherein its immateriality is evinced from the principles of reason and philosophy;” without date. In 1741, he went abroad with Mr. Hay, and resided some years at Utrecht; having there also lord Blantyre under his care. He made excursions from thence into Flanders, France, and Germany; his wife and ‘family residing in the mean time chiefly at Berwick upon Tweed. He returned to Scotland in 1747, and resided till his death at Whittingham, in the shire of East Lothian. He drew up, for the use of his pupils, and his son, a piece entitled “Matho: sive, Cosmotheoria puerilis, Dialogus. In quo prima elementa de mundi ordine et ornatu proponuntur, &c.” This was afterwards greatly enlarged, and published in English, in two volumes, 8vo. In 1750 was published, “An Appendix to his Enquiry into the nature of the human Soul” wherein he endeavours to remove some difficulties, which had been started against his notions of the “vis inertias” of matter, by Maclaurin, in his “Account of Sir Isaac Newton’s Philosophical Discoveries.” To this piece Mr. Baxter prefixed a dedication to Mr. John Wilkes, afterwards so well known in the political world, | with whom he had commenced an acquaintance abroad. He died this year, April the 23d, after suffering for some months under, a complication of disorders, of which the gout was the chief, and was buried in the family vault of Mr. Hay, at Whittingham. 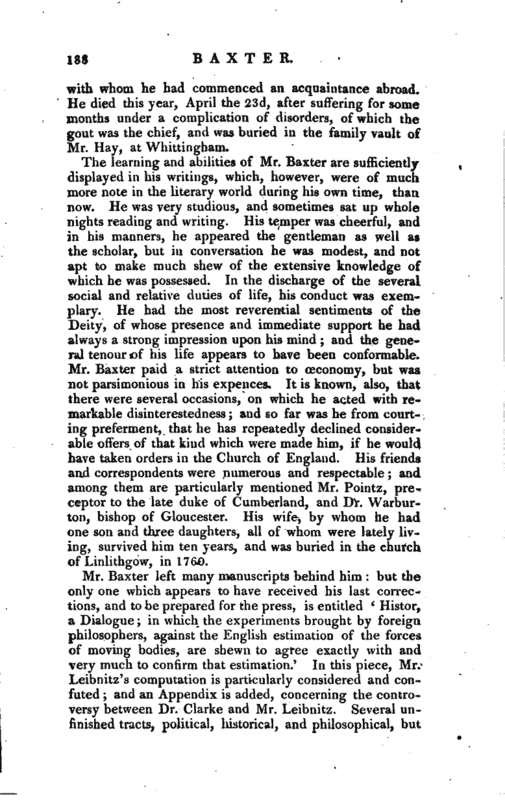 The learning and abilities of Mr. Baxter are sufficiently displayed in his writings, which, however, were of much more note in the literary world during his own time, than now. He was very studious, and sometimes sat up whole nights reading and writing. His temper was cheerful, and in his manners, he appeared the gentleman as well as the scholar, but in conversation he was modest, and not apt to make much shew of the extensive knowledge of which he was possessed. In the discharge of the several social and relative duties of life, his conduct was exemplary. He had the most reverential sentiments of the Deity, of whose presence and immediate support he had always a strong impression upon his mind; and the general tenour of his life appears to have been conformable. Mr. Baxter paid a strict attention to ceconomy, but was not parsimonious in his expences. It is known, also, that there were several occasions, on which he acted with remarkable disinterestedness; and so far was he from courting preferment, that he has repeatedly declined considerable offers of that kind which were made him, if he would have taken orders in the Church of England. His friends and correspondents were numerous and respectable; and among them are particularly mentioned Mr. Pointz, preceptor to the late duke of Cumberland, and-,Dr. Warburton, bishop of Gloucester. His wife, by whom he had one son and three daughters, all of whom were lately living, survived him ten years, and was buried in the church of Linlithgow, in 1760. 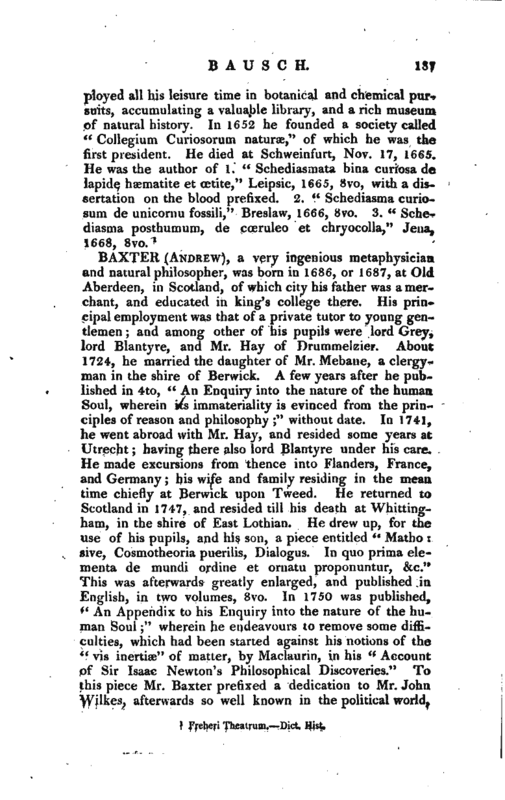 Mr. Baxter left many manuscripts behind him: but the only one which appears to have received his last corrections, and to be prepared for the press, is entitled ‘ Histor, a Dialogue; in which the experiments brought by foreign philosophers, against the English estimation of the forces of moving bodies, are shewn to agree exactly with and very much to confirm that estimation.’ In this piece, Mr. Leibnitz’s computation is particularly considered and confuted; and an Appendix is added, concerning the controversy between Dr. Clarke and Mr. Leibnitz. Several unfinished tracts, political, historical, and philosophical, but | chiefly the latter, were also lately in the possession of his family. In 1779, the late Rev. Dr. Duncan of South Warmborough, published " The evidence of reason in proof of the Immortality of the Soul, independent on the mofe abstruse inquiry into the nature of matter and spirit. Collected from the Mss. of Mr. Baxter,’ 7 London, 8vo. 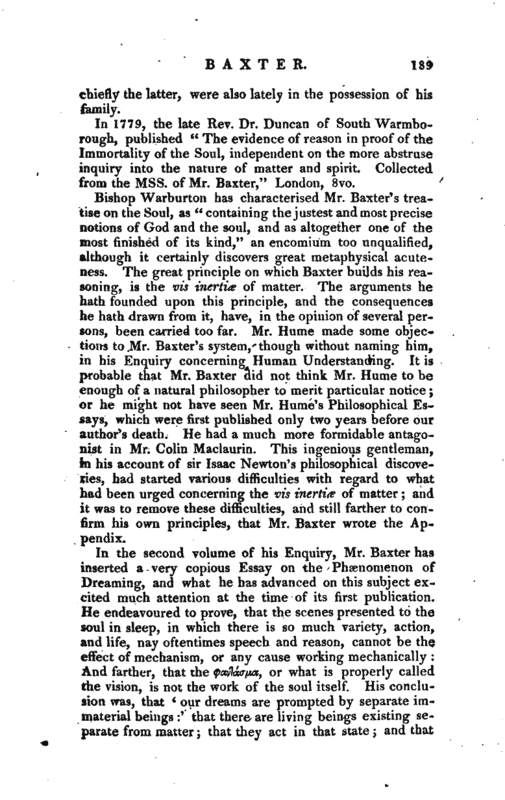 Bishop Warburton has characterised Mr. Baxter’s treatise on the Soul, as “containing the justest and most’precise notions of God and the soul, and as altogether one of the most finished of its kind,” an encomium too unqualified, although it certainly discovers great metaphysical acuteness. The great principle on which Baxter builds his reasoning, is the vis inertia of matter. The arguments he hath founded upon this principle, and the consequences he hath drawn from it, have, in the opinion of several persons, been carried too far. Mr. Hume made some objections to Mr. Baxter’s system, though without naming him, in his Enquiry concerning Human Understanding. It is probable that Mr. Baxter did not think Mr. Hume to be enough of a natural philosopher to merit particular notice; or he might not have seen Mr. Hume’s Philosophical Essays, which were first published only two years before our author’s death. He had a much more formidable antagonist in Mr. Colin Maclaurin. This ingenious gentleman, in his account of sir Isaac Newton’s philosophical discoveries, had started various difficulties with regard to what had been urged concerning the vis inertia of matter; and it was to remove these difficulties, and still farther to confirm his own principles, that Mr. Baxter wrote the Appendix. Biog. Britanuica. Tytler’s Life of Kames, vol. I. p. 2-1.